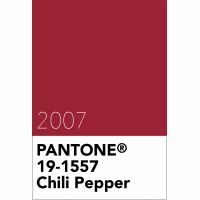 In 2007 Pantone, the leading global authority on colour and provider of professional colour standards for the design, fashion and printing industries, selected Chili Pepper 19-1557 as it's colour of the year. A deep, spicy red colour, this engaging hue strikes a high note for fashion and personal expression by its boldness and eye-catching, sophistication. Chili Pepper gives off an outgoing, confident, design-savvy attitude. Chili Pepper 19-1557 is one of the 3,000 colours available in Pantone’s Fashion, Home + Interiors range of interior and exterior paint and textile colours. Chili Pepper 19-1557 is from thePantone Fashion, Home + Interiors colour library.